A catechism ( /ˈkætəˌkɪzəm/; from Ancient Greek: κατηχέω, "to teach orally") is a summary or exposition of doctrine and serves as a learning introduction to the Sacraments traditionally used in catechesis, or Christian religious teaching of children and adult converts. Catechisms are doctrinal manuals – often in the form of questions followed by answers to be memorised – a format that has been used in non-religious or secular contexts as well. The term catechumen refers to the designated recipient of the catechetical work or instruction. In the Catholic Church, catechumens are those who are preparing to receive the Sacrament of Baptism. Traditionally, they would be placed separately during Holy Mass from those who had been baptized, and would be dismissed from the liturgical assembly before the Profession of Faith (Creed) and General Intercessions (Prayers of the Faithful). Catecheticals are characteristic of Western Christianity but are also present in Eastern Orthodox Christianity. In 1973, The Common Catechism, the first joint catechism of Catholics and Protestants, was published by theologians of the major Western Christian traditions, as a result of extensive ecumenical dialogue. Q. What is the chief end of man? A. To glorify God and enjoy Him forever! Q. What rule hath God given to direct us how we may glorify and enjoy Him? A. The word of God which is contained in the Scriptures of the Old and New Testaments is the only rule to direct us how we may glorify and enjoy him. The catechism's question-and-answer format, with a view toward the instruction of children, was a form adopted by the various Protestant confessions almost from the beginning of the Reformation. Among the first projects of the Reformation was the production of catechisms self-consciously modelled after the older traditions of Cyril of Jerusalem and Augustine. These catechisms showed special admiration for Chrysostom's view of the family as a "little church", and placed strong responsibility on every father to teach his children, in order to prevent them from coming to baptism or the Lord's table ignorant of the doctrine under which they are expected to live as Christians. Therefore it is the duty of every father of a family to question and examine his children and servants at least once a week and to ascertain what they know of it, or are learning and, if they do not know it, to keep them faithfully at it. The catechism, Luther wrote, should consist of instruction in the rule of conduct, which always accuses us because we fail to keep it (Ten Commandments), the rule of faith (Apostles' Creed), the rule of prayer (Lord's Prayer), and the sacraments (baptism, confession, and communion). 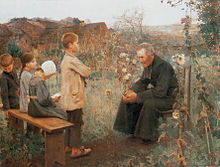 However, it is not enough for them to comprehend and recite these parts according to the words only, but the young people should also be made to attend the preaching, especially during the time which is devoted to the catechism, that they may hear it explained and may learn to understand what every part contains, so as to be able to recite it as they have heard it, and, when asked, may give a correct answer, so that the preaching may not be without profit and fruit. A. We should fear, love, and trust in God above all things. We are all directed to one Christ, in whose truth being united together, we may grow up into one body and one spirit, and with the same mouth also proclaim whatever belongs to the sum of faith. Catechists not intent on this end, besides fatally injuring the Church, by sowing the materials of dissension in religion, also introduce an impious profanation of baptism. For where can any longer be the utility of baptism unless this remain as its foundation — that we all agree in one faith? Wherefore, those who publish Catechisms ought to be the more carefully on their guard, by producing anything rashly, they may not for the present only, but in regard to posterity also, do grievous harm to piety, and inflict a deadly wound on the Church. The scandal of diverse instruction is that it produces diverse baptisms and diverse communions, and diverse faith. However, forms may vary without introducing substantial differences, according to the Reformed view of doctrine. John Calvin produced a catechism while at Geneva (1541), which underwent two major revisions (1545 and 1560). Calvin's aim in writing the catechism of 1545 was to set a basic pattern of doctrine, meant to be imitated by other catechists, which would not affirm local distinctions or dwell on controversial issues, but would serve as a pattern for what was expected to be taught by Christian fathers and other teachers of children in the church. The catechism is organized on the topics of faith, law, prayer and sacraments. Master. What is the chief end of human life?#:Scholar. To know God by whom men were created. M. What reason have you for saying so? S. Because he created us and placed us in this world to be glorified in us. And it is indeed right that our life, of which himself is the beginning, should be devoted to his glory. M. What is the highest good of man? S. The very same thing. After Protestantism entered into the Palatinate, in 1546 the controversy between Lutherans and Calvinists broke out, and especially while the region was under the elector Otto Heinrich (1556–1559), this conflict in Saxony, particularly in Heidelberg, became increasingly bitter and turned violent. When Frederick III, Elector Palatine came into power in 1559 he put his authority behind the Calvinistic view on the Lord's Supper, which denied the local presence of the body of Jesus Christ in the elements of the sacrament. He turned Sapienz College into a school of divinity, and in 1562 he placed over it a pupil and friend of Luther's colleague, Philipp Melanchthon, named Zacharias Ursinus. In an attempt to resolve the religious disputes in his domain, Frederick called upon Ursinus and his colleague Caspar Olevianus (preacher to Frederick's court) to produce a catechism. The two collaborators referred to existing catechetical literature, and especially relied on the catechisms of Calvin and of John Lasco. To prepare the catechism, they adopted the method of sketching drafts independently, and then bringing together the work to combine their efforts. "The final preparation was the work of both theologians, with the constant co-operation of Frederick III. Ursinus has always been regarded as the principal author, as he was afterwards the chief defender and interpreter of the Catechism; still, it would appear that the nervous German style, the division into three parts (as distinguished from the five parts in the Catechism of Calvin and the previous draft of Ursinus), and the genial warmth and unction of the whole work, are chiefly due to Olevianus." (Schaff, in. Am. Presb. Rev. July 1863, p. 379). The structure of the Heidelberg Catechism is spelled out in the second question; and the three-part structure seen there is based on the belief that the single work of salvation brings forward the three persons of the Trinity in turn, to make God fully and intimately known by his work of salvation, referring to the Apostles' Creed as an epitome of Christian faith. Assurance of salvation is the unifying theme throughout this catechism: assurance obtained by the work of Christ, applied through the sacraments, and resulting in grateful obedience to the commandments and persistence in prayer. Q. What is thy only comfort in life and death? A. That I with body and soul, both in life and death, am not my own, but belong unto my faithful Saviour Jesus Christ; who, with his precious blood, has fully satisfied for all my sins, and delivered me from all the power of the devil; and so preserves me that without the will of my heavenly Father, not a hair can fall from my head; yea, that all things must be subservient to my salvation, and therefore, by his Holy Spirit, He also assures me of eternal life, and makes me sincerely willing and ready, henceforth, to live unto him. Q. How many things are necessary for thee to know, that thou, enjoying this comfort, mayest live and die happily? A. Three; the first, how great my sins and miseries are; the second, how I may be delivered from all my sins and miseries; the third, how I shall express my gratitude to God for such deliverance. The Heidelberg Catechism is the most widely used of the Catechisms of the Reformed churches. The first page of the ninth edition of The Shorter Catechism Explained (Perth, 1785). Together with the Westminster Confession of Faith (1647), the Westminster Assembly also produced two catechisms, a Larger and a Shorter, which were intended for use in Christian families and in churches. These documents have served as the doctrinal standards, subordinate to the Bible, for Presbyterians and other Reformed churches around the world. The Shorter Catechism shows the Assembly's reliance upon the previous work of Calvin, Lasco, and the theologians of Heidelberg. It comprises two main sections summarizing what the Scriptures principally teach: the doctrine of God, and the duty required of men. Questions and answers cover the usual elements: faith, the Ten Commandments, the sacraments, and prayer. A. Man's chief end is to glorify God, and to enjoy him forever. Q. What do the scriptures principally teach? Oecolampadius composed the Basel Catechism in 1526, Leo Juda (1534) followed by Bullinger (1555) published catechisms in Zurich. The French Reformed used Calvin's Genevan catechism, as well as works published by Louis Cappel (1619), and Charles Drelincourt (1642). English Calvinistic Baptists typically adopted Reformed catechisms, modifying them to reflect their own convictions concerning the nature of the church and the sacrament of baptism. In 1680, the Baptist minister Hercules Collins published his own revision of the Heidelberg Catechism. Later, the General Assembly of 1677 adopted a catechism that was largely based on the Westminster Shorter Catechism. However, this catechism was not published until 1689, after the passing of the Act of Toleration 1689. While the Pentecostal movement has no one official catechism or confession, nevertheless Pentecostal authors have produced catechetical works. William Seymour, founder of the Azusa Street revival, included a catechism in the Doctrines and Disciplines of the Azusa Street Apostolic Faith Mission. Assemblies of God minister Warren D. Combs produced a catechism in the 1960s. In 2016 Henry Volk the host of the Theology in Perspective podcast authored a resource entitled, A Pentecostal Catechism. The Anglican Book of Common Prayer includes a catechism. In older editions it is a brief manual for the instruction of those preparing to be brought before the bishop for confirmation: the baptised first professes his baptism, and then rehearses the principal elements of the faith into which he has been baptised: the Apostles' Creed, Ten Commandments, the Lord's Prayer, and the sacraments. Catechist: What is your Name? Catechist: Who gave you this Name? Answer: My Godfathers and Godmothers in my Baptism; wherein I was made a member of Christ, the child of God, and an inheritor of the kingdom of heaven. The "N. or M." stands for the Latin, "nomen vel nomina", meaning "name or names". It is an accident of typography that "nomina" came to be represented by "m". The 1979 American book has a considerably longer catechism intended as "an outline of instruction" and "a brief summary of the Church's teaching". The Catechism of the Methodist Episcopal Church is an official catechism for that denomination, now known as the United Methodist Church. More recent publications are A Larger Catechism: For Members of the Christian Methodist Episcopal Church (printed in the United States) and A Catechism for the Use of the People Called Methodists (printed in Great Britain). Besides the manuals of instruction that were published by the Protestants for use in their families and churches, there were other works produced by sectarian groups intended as a compact refutation of orthodoxy. For example, Socinians in Poland published the Racovian Catechism in 1605, using the question and answer format of a catechism for the orderly presentation of their arguments against the Trinity and the doctrine of Hell, as these were understood by the Reformed churches from which they were forced to separate. The Anabaptists have also produced catechisms of their own, to explain and defend their distinctives. The Catechism of the Catholic Church (see below) is the catechism that is in most widespread use among Catholics today. It is the official catechism of the Church. For Catholics, all the canonical books of the Bible (including the Deuterocanonical books), the tradition of the Church and the interpretation of these by the Magisterium (which may be outlined in a catechism, a compendium or a declaration) constitute the complete and best resource for fully attaining to God's revelation to mankind. Catholics believe that sacred scripture and sacred tradition preserved and interpreted by the Magisterium are both necessary for attaining to the fullest understanding of all of God's revelation. The term catechist is most frequently used in Catholicism, often to describe a lay catechist or layperson with catechetical training who engages in such teaching and evangelization. This can be in both parish church and mission contexts. A question and answer format catechism that was the standard catechetical text in Great Britain in the earlier part of the 20th century. Popularly called the Penny Catechism, as the original version only cost one penny. Various editions of the Penny Catechism were issued through the century and changes were made to the text. An online version is at http://www.proecclesia.com/penny%20catechism/index.htm. The hotly debated Dutch Catechism, De nieuwe katechismus (English translation: A New Catechism), of 1966 was the first comprehensive post-Vatican II Catholic catechism. It was commissioned and authorised by the Catholic hierarchy of the Netherlands, and in its foreword declares as its intention: "to make the message of Jesus Christ sound as new as it is." The catechism, a bestseller, contained a number of problematic formulations. These were reviewed by a commission of cardinals, who detailed several significant shortcomings in the new catechism's presentation of Catholic doctrine. They were able, nonetheless, to "leave untouched by far the greatest part of the New Catechism," while offering their support for "the laudable purpose of the authors of the Catechism, namely, to present the eternal good tidings of Christ in a way adapted to the understanding and the thinking of the present day man." The current Catechism of the Catholic Church is the first complete systematic synthesis of faith issued since the Council of Trent in 1566. It contains articles on the classical topics of the official teaching of the Catholic Church on all matters of faith and morals. Since the official language of the Catholic Church is Latin, official teaching documents distributed in Latin are unlikely to change in perceived meaning over time. The Latin language version of the catechism, published 8 Sept 1997, is the editio typica—the normative and definitive text. The principal source materials for this work are the Sacred Scriptures, the Church Fathers, the liturgy, and the Magisterium. This catechism is intended to serve "as a point of reference for the catechisms or compendia that are composed in the various countries." – Extraordinary Synod of Bishops 1985, Final Report II B a, 4. Fidei depositum is an Apostolic Constitution which states that the catechism of the Catholic Church is for the laity in its address to all the people of God. It originated with a request of Pope John Paul II in February 2003 and was issued by his successor Pope Benedict XVI June 28, 2005. The English version was printed at Libreria Editrice Vaticana in 2006. Unlike the larger catechism, the Compendium is similar in format to the Baltimore Catechism with 598 questions and answers, providing an easier format with only the "essential" contents of the Catechism of the Catholic Church as the title suggests. The 1992 Vatican catechism had several aims, among them to be an "authentic reference text for teaching Catholic doctrine and particularly for preparing local catechisms". American bishops responded with the 2006 United States Catholic Catechism for Adults (USCCB, 2006) – similar in format to a college textbook, targeting adults, contain seven elements that bring more depth to the material than the 'Compendium', providing more flexibility for diverse groups of people to study its contents. Each section or chapter contains the following: story or lesson of faith, foundation and application, sidebars, relationship to culture, discussion questions, doctrinal statements, and meditation and prayer. The lessons of faith stories are about individuals from the United States and allow the American reader to better relate to these individuals. This version of the catechism is available on audio CD-ROM as well. The Enchiridion symbolorum, definitionum et declarationum de rebus fidei et morum also known as Enchiridion or Denzinger, is a compendium of all basic texts of Catholic dogma and morality since the apostles. Commissioned by Pope Pius IX, it has been in use since 1854, and has been updated periodically. It is a compendium of faith, like a catechism. By including all relevant teachings throughout history, it is at the same, more than a catechism. It is a search instrument for theologians, historians and anybody interested in Christian religion. The latest updates of the Enchiridion extend to the teachings of Pope John Paul II. The Archbishop of Baltimore Cardinal James Gibbons is quoted in earlier versions of the Enchiridion, that every theologian should have always two books at hand, the Holy Bible and this Enchiridion. The Rev Henry Tuberville, DD wrote this catechism in 1649 at the English College of Douay in Flanders. It is based on the Roman Catechism of the Council of Trent and was similarly written with the purpose of teaching Christian doctrine during the tumultuous English Reformation. It is a testament to Rev. Tuberville and his colleagues at Douay that it remains one of the clearest and most direct compendiums of Catholic teaching in the English language. The Catechism for Filipino Catholics (CFC) is a contextualised and inculturated Roman Catholic catechism for Filipinos prepared by the Catholic Bishops' Conference of the Philippines and approved by the Holy See. The draft was produced by the Conference's "Episcopal Commission on Catechesis and Catholic Education," and is an update of the late 16th century Doctrina Christiana en Lengua Espanola Y Tagala, which was a Hispano-Tagalog version of the earlier Hispano-Chinese Doctrina that was the first book printed in the Philippines using moveable type. The Doctrina Cristiana was written in Tagalog (both in a hispanised Latin script and the then-common indigenous Baybayin script), as well as Spanish. Amongst the contents of the Doctrina are the Spanish alphabet and phonics, archaic Tagalog translations of basic prayers shown in both languages and scripts, and a brief catechism in a question-and-answer format. Laurence Vaux, B.D., a Catholic martyr, first published his catechism, also called The Catechism of Laurence Vaux or Vaux's Catechism, in Louvain in 1567. Six further editions in rapid succession, emanating from Antwerp and Liège, testified to its widespread popularity and effectiveness. The 1583 Liège issue was reprinted with biographical introduction for the Chetham Society by Thomas Graves Law in 1885. This edition contains also Vaux's paper "The Use and Meaning of Ceremonies," and a few further pages of instruction added by the Liège publisher. The catechism is practically formed on the same lines as its successor of today, explaining in sequence the Apostles' Creed, the Lord's Prayer and Hail Mary (excluding the second half beginning at "Holy Mary…"), the Ten Commandments (at considerable length), the Sacraments and the offices of Christian justice. The treatise on the ceremonies discusses the use of holy water, candles, incense, vestments and so forth. The catechetical instructions of Saint Thomas Aquinas were used generally throughout the 13th and 14th centuries as manuals and textbooks for priests and teachers of religion. "The Explanations of St. Thomas," wrote Spirago, "are remarkable for their conciseness and their simplicity of language; they are especially noteworthy because the main parts of the catechetical course of instruction are brought into connection with one another so that they appear as one harmonious whole." The influence of these works is especially prominent in the "Roman Catechism" which the Council of Trent ordered written for parish priests and for all teachers of religion. Many of the explanatory passages in both works are almost identical. 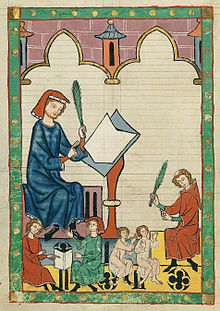 Ignorantia Sacerdotum are the first words and the better-known title of De Informatione Simplicium, a catechetical manual drafted by Archbishop Pecham's provincial Council of Lambeth in 1281. It called for the memorisation of the Apostle's Creed, the Ten Commandments, and the two-fold injunction to "love the Lord thy God with all thy heart... and thy neighbour as thyself.". It also emphasised the Seven Virtues, the Seven Deadly Sins, the Seven Sacraments, and the Seven Works of Mercy. A 1357 translation into English is often called the Lay-Folk's Catechism. Q. "Where is the animal, O Lanoo? and where the Man? A. Fused into one, O Master of my Life. The two are one. But both have disappeared and naught remains but the deep fire of my desire. Judaism does not have a formal catechism. While there have been several attempts to formulate Jewish principles of faith, and some of these have achieved wide acceptance, none can be described as being in the form of a catechism. The most widely recited formulation, Yigdal, is in the form of a hymn based on Maimonides' 13 Articles of Faith. Bhaktivinoda Thakur's book Jaiva Dharma is an example of Gaudiya Vaishnava catechism. It follows the usual question-answer format. In the Pali Canon of Theravada Buddhism a small bit of catechism appears as the fourth section of the Khuddakapatha, as well as the forty-third and forty-fourth suttas of the Majjhima Nikaya. Henry Steel Olcott introduced his own form of Buddhist catechism, appropriated from Christianity, to Ceylon when setting up his Buddhist education system during the late 19th century Buddhist revival on the island. Islam teaches children and new Muslims the matters of faith, worship, and ethics in the form of a concise manual. They are popular in Turkish as Ilmihal (from the Arabic Ilm ul-Hal, Situation Science). The first chapter is the book of cleanliness and first to be taught are subjects such as: which are clean, what is clean and what is not clean, what people need to be cleansed from, how they should clean, and which water should they use to clean. In the past, catechisms were written to rehearse the basic knowledge of a non-religious subject. Examples include numerous political catechisms published from the 18th to the 20th century in Europe as well as in North and South America. See also the Catechism of the History of Newfoundland (c1856), the Coal Catechism (1898), and A Catechism of the Steam Engine (1856). "Elementary catechism on the Constitution of the United States" Arthur J. Stansbnr (1828), "Catechism of the Constitution of the United States" Lewis Cruger (1863) and "A Catechism of the Constitution of the United States of America" John V. Overall. Friedrich Engels' 1847 work Principles of Communism was written as a catechism: Engels subsequently decided that the format was not suited to the addition of historical material which he felt was necessary, and he and Karl Marx restructured the material and used it as the nucleus of The Communist Manifesto. Some literary works have also taken the form of a catechism. The 17th episode of James Joyce's novel Ulysses, known as "Ithaca", is written in the form of a catechism, as is Ted Hughes' poem Examination at the Womb Door, from the collection Crow. In Henry IV, Part 1: Act V, Scene I, Line 141 Falstaff refers to his monologue as a catechism, explaining his view of the virtue of honor. ^ "The Catechism of the Orthodox Church and Orthodox Faith @ Orthodox Answers". Orthodoxanswers.org. Archived from the original on 28 November 2010. Retrieved 14 October 2013. ^ "The Longer Catechism of The Orthodox, Catholic, Eastern Church". Pravoslavieto.com. Archived from the original on 22 July 2007. Retrieved 14 October 2013. ^ Commonweal, Volume 102. Commonweal Publishing Corporation. 1975. p. 31. The book offers the first comprehensive statement of religious faith produced jointly by Catholic and Protestant theologians since the separation of the churches over four centuries ago. ^ Green, Ian (1996). The Christian's ABC: Catechisms and Catechizing in England c.1530-1740. Oxford: Clarendon Press – via Questia (subscription required). pp. 14–15. Archived from the original on 2018-01-08. ^ Green, Ian (1996). The Christian's ABC: Catechisms and Catechizing in England c.1530-1740. Oxford: Clarendon Press – via Questia (subscription required). p. 17. Archived from the original on 2018-01-08. ^ "Westminster Shorter Catechism". Archived from the original on 2012-04-07. Retrieved 2012-04-09. ^ Combs, Warren D. Pentecostal Catechism. Thorne Printing. ^ Volk, Henry. A Pentecostal Catechism (1 ed.). CreateSpace Independent Publishing Platform. ISBN 9781539696629. ^ "Concerning the Catechism". The Book of Common Prayer. Church Publishing. 1979. p. 844. ^ Manual of the Methodist Episcopal Church. Phillips & Hunt. 1880. p. 278. ^ Marsh, Clive (10 May 2006). Methodist Theology Today. A&C Black. p. 235. ISBN 9780826481047. ^ "Introduction - Confession of Faith in a Mennonite Perspective - Mennonite Church Canada". mennonitechurch.ca. Archived from the original on 9 October 2017. Retrieved 8 May 2018. ^ "DECLARATION OF THE COMMISSION OF CARDINALS ON THE". www.ewtn.com. Archived from the original on 30 October 2017. Retrieved 8 May 2018. ^ "Lessing J. Rosenwald Collection" Library of Congress. World Digital Library. Retrieved 10 November 2010. ^ Councils & Synods, with Other Documents Relating to the English Church, vol. 2: 1205-1313, ed. F. M. Powicke and C. R. Cheney (Oxford: Clarendon Press, 1964), part 2, p. 900-905.Excerpts appear in William Lyndwood's Provinciale. ^ The Lay Folks’ Catechism or the English and Latin Versions of Archbishop Thoresby’s Instructions for the People (London: Published for the Early English Text Society, by Kegan Paul, Trench, Trübner & Co., 1901). ^ electricpulp.com. "ČĪDAG ANDARZ Ī PŌRYŌTKĒŠĀN – Encyclopaedia Iranica". www.iranicaonline.org. Archived from the original on 10 December 2017. Retrieved 8 May 2018. ^ Peterson, Joseph H. "Chidag Andarz i Poryotkeshan: A Zoroastrian Catechism". www.avesta.org. Archived from the original on 15 September 2017. Retrieved 8 May 2018. ^ Jean-Charles Buttier, Émilie Delivré (ed. ),"Les catéchismes républicains Archived 2009-11-20 at the Wayback Machine", La Révolution française, Institut d'Histoire de la Révolution Française, Paris, sept. 2009. ^ "Catechism of the history of Newfoundland". archive.org. 8 August 2004. Archived from the original on 8 August 2004. Retrieved 8 May 2018. ^ William Jasper Nicolls, Coal Catechism, 1898, published by George W. Jacobs & Co, 1906. ^ Bedacht, Max (1925). "Introduction" (PDF). Principles of Communism. Little Red Library. Chicago: Daily Worker Pub. Co. p. 4. Archived (PDF) from the original on 3 March 2016. Retrieved 27 April 2016. ^ Hughes, Ted. "Examination at the Womb Door". Crow. Archived from the original on 2007-06-26. Retrieved 2007-06-23. Roland F. Palmer and John G. McCausland, The Catechist's Handbook; and, The Church's Guide: Teaching the Canadian [Anglican] Church Catechism to Children and to Older Persons (Bracebridge, Ont. : Society of Saint John the Evangelist, 1962). Wikisource has the text of the 1911 Encyclopædia Britannica article Catechism. This page was last edited on 23 February 2019, at 17:50 (UTC).